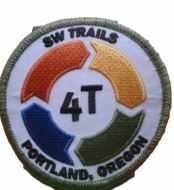 The 4T Trail is maintained by SW Trails in cooperation with Portland Parks and Recreation, Portland Bureau of Transportation, TriMet and Oregon Department of Transportation and Friends of Marquam Nature Park. The 4TTrail.org website is maintained by SW Trails. To report problems or ask questions about the 4T Trail , either call Don Baack at 503-246-2088 or send him an email by filling in the following form.